We've gone off to Egypt again to work in TT99. Submissions will have to wait until we return I fear. However, you should be able to follow what we are doing in Egypt by looking at the TT99 Dig Diary. The seventh earl was of course the grandson of the discoverer of the tomb of Tutankhamun. In his time as holder of the title, the cache of small objects left over after sale of the great Carnarvon collection was discovered at Highclere Castle. The deadline for the volume to celebrate the centennial of the Cairo Museum has been extended from July 31 to August 10, 2001. To try and deal with the queries I and colleagues get about our subject, I have begun a FAQ on the subject. Learn more about it by clicking here. I have also been checking some of the links on the ER pages, and was appalled to note how many, particularly on the Other Egypt page, were out of date. This speaks volumes for the very valid concern of the impermanence and general 'flakiness' of the web. I would please ask users of these pages to let me know of links which do not work, to help me maintain standards. Readers are probably aware that the libraries in the Ashmolean Museum in Oxford have been undergoing a major rebuilding programme. It is intended that they reopen this summer; this document describes the proposed arrangements. An ancient tomb of Nas I, mother of Gid-Khin-Su, ruler of Al-Wahat Al-Bahariya (Bahariya Oases), was unearthed Thursday, said Zahi Hawwas, Director of Cairo and Giza Antiquities Department. Gaballa Ali Gaballa, Secretary-General of the Supreme Council of Antiquities (SCA), said that the rock-hewn tomb dates back to the era of the 26th Dynasty (2500 years ago). The number of tombs that belong to the family of Khin-Su hus hits seven, with only nine other tombs of the 26th Dynasty left. Hawwas said excavation works will be resumed next September. PDF files of all Egyptian articles in the Bulletin of the Museum of Fine Arts, Boston are now online. See http://www.mfa.org/giza/pages/publpdfsbmfaall.html. These are quite large PDF files and will take some time to download. The latest issue is here. Readers are always urged to check with institutions before going to events. The authorities at the Egyptian Museum Cairo are planning a volume to celebrate the 100th anniversary of the setting up of the museum in 1902. Contributions are invited; please read this announcement. Susanna Thomas and a team from Liverpool has excavated in February/March 2001 three still functioning limestone wells each with 2 rows of cartouches of Ramesses II at the west Delta site of Tell Abqa'in (Bahriya province). Each is approximately 1.60m diameter, and between 3.4 and 3.95m deep. They have also found blocks from at least one more well, and plan on going back next year with remote sensing equipment. 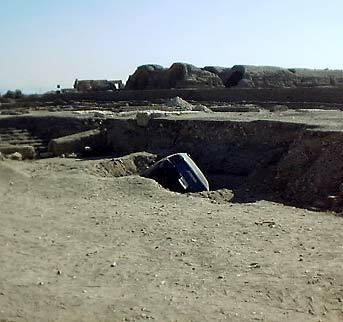 The site is one of the series of forts from Memphis to Zawiyet Umm el-Rakham. The wells were just inside the south east corner of substantial (nearly 5m wide) perimeter walls. Information from Susanna Thomas (Susanna.Thomas@liverpool.ac.uk). I understand that a web page (www.liv.ac.uk/abqain) is being prepared, but it was not at this address at the time of posting. This year's Glanville Lecture, arranged by the Fitzwilliam Museum, Cambridge, will be delivered by Professor John Baines of the University of Oxford at 2.30 pm in the Mill Lane Lecture Rooms, Cambridge, on Saturday, 13 October. The title will be 'Ancient Egyptian bodies: divine, human, demonic' and tickets will be available in September from Dr Lucilla Burn, Department of Antiquities, The Fitzwilliam Museum, Cambridge CB2 1RB. The exhibition 'Cleopatra of Egypt: from History to Myth' will open in the British Museum on 12 April 2001. An associated conference, 'Cleopatra Reassessed' will take place in the British Museum on 13-15 June. See the full programme. Jack Josephson informs me that Mamdouh M. Eldamaty has been appointed director general of the Egyptian Museum, Cairo. He is currently asst. professor at Ain Shams University. Apologies for the break in news while I was away. I was installing the British Museum exhibition 'Eternal Egypt' in the Toledo Museum of Art. It is with great personal sadness that I must inform you that our friend and colleague Enrichetta Leospo, Curator of Egyptology in the Museo Egizio di Torino, passed away last night (01.02). The funeral will be held tomorrow afternoon (03.02). In spite of her sickness, Enrichetta worked until the end. Let us remember a kind, brave lady whose whole life was Egyptology. The Department of Ancient Studies at the University of Stellenbosch presents MACU: Mosaic of Ancient Cultures - online courses on the ancient world. The first course "Introduction to the cultures of the Ancient Near East" focuses on the cultures of the Ancient Near East (i.e. Egypt, Ethiopia, Mesopotamia, Syro-Palestine). It will consist of notes (with clickable maps, diagrams and pictures), a chat room, a bulletin board and online evaluation. Successful students will receive a certificate. Topics to be discussed (amongst others) will be history, religion, art, society & politics, environment and agriculture, etc. Readers will be aware of Dr Murnane's death on 17 November last year. I was honoured to be asked to write an obituary for The Guardian,which appeared on 23 January. The text I wrote (longer than that published) is also available online on this site. The latest issue is here. There are rather a lot of emendations and addtions flying around, which cannot easily be incorporated, so readers are urged to check with institutions before going. William L. Moran, Professor of Assyriology and Mellon Professor of the Humanities, emeritus, Harvard University, died on Dec. 19 at the age of 79 at his home in Brunswick, Maine. I note his passing on these pages as a number of readers will have used his important translations of the Amarna Letters. From Memphis comes the dreadful news that William Murnane has died suddenly after emergency heart surgery. He was only 55, and a great Egyptologist. He had been Professor of History in the University of Memphis, as well as being an Adjunct Professor in the Institute of Egyptian Art and Archaeology, since (I believe) 1987. Before that he had been, among other things, Deputy Director at Chicago House. He published widely, and his work is well-known to both the scholarly and the popular world. The subjects on which he interested himself were very wide-ranging, and to mention only three, I would choose Egyptian co-regencies, the reliefs of the temple of Karnak, and historical and epigraphic matters relating to the Amarna period. His best-known popular publication is the Penguin Guide to Ancient Egypt, which is by far the best guide around for those interested in the monuments; in the past few years he had also published a volume of excellent and readable translations called Texts of the Amarna Period. Bill was a great scholar and also a great colleague. On a personal note, my wife and I have known him since we began work in Thebes in the early 1980s, days of which we have many happy memories. Most recently I visited him in Memphis a couple of years ago and spent a most enjoyable but all too brief time there. He will be greatly missed. A new excavation method was inaugurated today by the French Mission in the Ramesseum. It is an improvement of the so-called "Carter's horse method", used by the famous archaeologist in 1900 to find the statue of Mentuhotep II at Deir el-Bahari. More recently a donkey variant of that system was used in the discovery of the golden mummies in Bahariya Oasis. But the latest update of the method has to be attributed to the Ramesseum team who used a car. Also, although the linked picture does not allow us to appreciate the details, we assured that it is a Citroën. Have the French archaeologists also found a way to display the name of the sponsor on the excavations? Steve Vinson has asked me to post this note on an intensive course on Middle Egyptian he is offering. I'm back from Egypt. Note that I have corrected the URL for the TT99 site below. I'm going to TT99 to work earlier than usual this year. Thus I apologise for the break in service which will occur until late October. Do however send news and I will see what I can do. You can follow work in Thebes via the TT99 Dig Diary. The University of Liverpool Mission at the Mediterranean fort site of Umm el-Rakhum has found some well-preserved statues of the Ramesside period. More information will probably become available soon on the SCA web sites. The moves and changes which have affected the Department of Egyptian Antiquities over the past few years are still continuing. Another large move of offices and part of the collection is in prospect, which means that services will be further reduced for a period of time. An announcement will shortly appear on the BM web site for information. I understand that the French Egyptologist Jean Vercoutter died on July 16, 2000 at the age of 89. From Deborah Sweeney: Prof. Alan Schulman passed away on Thursday, July 20th, in Tel Aviv, and was buried the same day. He leaves a wife, Daliah, and two grown children, Anath and Magen. Professor Schulman was Professor of Ancient History at Queens College in New York for many years. He was a prolific writer, whose interests ranged widely over New Kingdom history, the worship of foreign gods in Egypt, Egyptian stelae. and many other topics, particularly the military history of ancient Egypt, which was an especial favourite of his. Rehov Ha Banim 51, Herzeliya, Israel. It is my sad duty to inform ANES colleagues about the death of the outstanding Egyptologist Oleg Dmitrievich Berlev who passed away after a long illness on July 7 at the age of 67 years. Condolences can be sent to his widow to the address which follows: Prof. A. I. Elanskaja, Oriental Institute, Dvortsovaja nab. 18, 191 186 St. Petersburg. Fax: (812) 312 14 65. E-mail: <invost@mail.convey.ru>. Editor's note: Berlev was without doubt the most prominent Egyptologist in the Soviet Union and Russia of recent times. He produced many important books and articles, and his most important area of research was on the Middle Kingdom. Results of voting from the recent ballots will soon be available from the IAE's web site. Chris Eyre has been elected president of the association, and Grenoble has been selected (by a very narrow margin) as the site of the next congress. This year's Sackler Lecture will be given by Jan Assmann from Heidelberg and will be on 26 July 2000. . The media have been drawing attention to a discovery by Franck Goddio's Franco-Egyptian team of an underwater long-lost ancient classical city in the area of Abukir Bay, just to the east of Alexandria. Here is one BBC story and another BBC story. Goddio's site will provide other information. A report in the Guardian indicates that the idea is to survey the site and only bring to the surface certain objects. This seems very much to be the correct approach, as otherwise the site is unthreatened. The SCA has of course expressed the wish that priority be given to threatened sites in the Delta proper. The latest London Diary for the ANE is here. This year's Sackler Lecture will be given by Jan Assmann from Heidelberg and will be on 26 July 2000. More information can be found on the BM's web site. A major international colloquium, entitled 'The Theban Necropolis: Past, Present and Future' will take place on the two following days, 27-28 July 2000. Again, further information will be found on the Museum's web site. The web site has been redesigned and relaunched. The home page for the museum is now www.thebritishmuseum.ac.uk and the Department of Egyptian Antiquities is at http://www.thebritishmuseum.ac.uk/egyptian/index.html. The Department has about 150 pages of information about objects in the Collection, the Galleries, as well as further information about Egyptology.